Ontech Systems provides efficient, reliable IT support services to Brookfield based businesses as well as the Greater Milwaukee area. A Brookfield, WI law firm, an accountant and the trendiest bar in town may have little in common, but when it comes to IT support, they share one thing in common – they need their IT network to work seamlessly and run continuously in the background while they take care of day to day business. With a client retention rate of 98% over the past 10 years, our clients know and trust that we will keep their business running smoothly. Brookfield businesses have trusted Ontech Systems with their IT services since 2004. 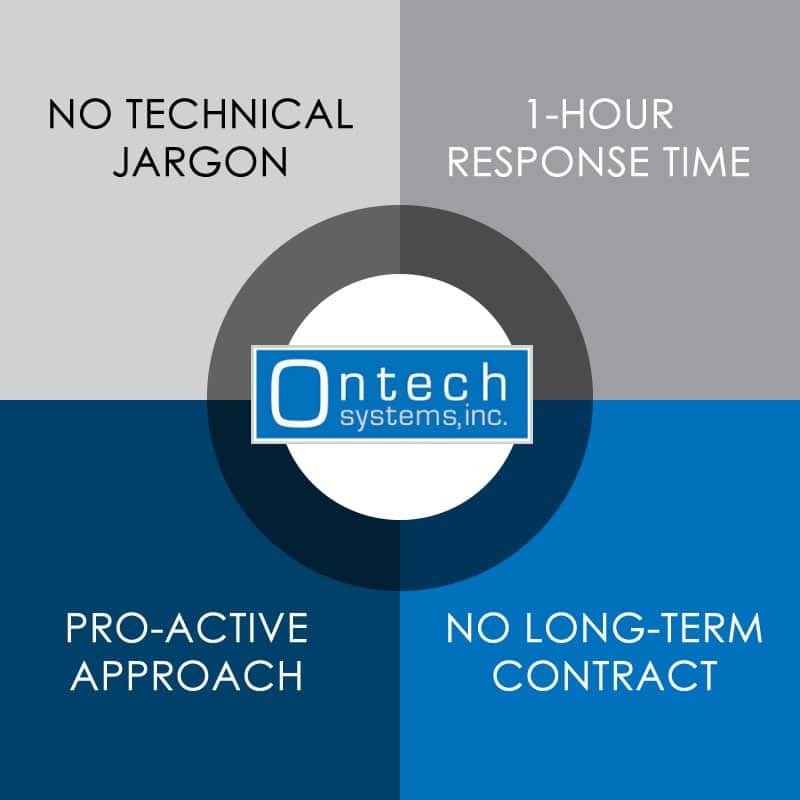 When you choose Ontech Systems, you choose an IT provider who is responsive to your requests and mindful of your current needs and future growth. From business phone services to managed services, Ontech can assist with all your networking needs. We take a pro-active approach to all our IT and networking solutions. Our experienced technical staff has extensive experience in providing solutions that meet and exceed the necessary compliance regulations in a wide variety of industries for Brookfield area businesses such as law firms, local government, manufacturing companies, healthcare, insurance and finance and a wide variety of small businesses. We have techs who will speak your language – no technical jargon. We want to be sure you understand what we are doing and why we are doing it—after all, it’s your business. We’re responsive. With a 1-hour response time, we are here for you when you need us. When you contact us during normal business hours, you can count on us to respond within 1 hour by phone or email —not hours, days or weeks later. We want you up and running as quickly as possible. Our technicians will factor your overall business goals and long-term growth potential into our IT support plan. We’re not a break/fix IT firm. We consider your company’s growth outlook as well. No contract is required. Our clients are satisfied and stay with us because they want to—not because they are locked into a long term contract. To evaluate Ontech Systems and see if we are a good fit for your business, we invite you to request a no-obligation Network Discovery. During this free service, our technicians will evaluate your current network and offer ideas to improve the productivity and efficiency of your Brookfield business. To start, our consultant will audit your network, infrastructure, server, PC’s, backup and security performance. Once completed, we will engage you in question and answer session to inform you of our findings. To schedule your free, no-obligation network discovery today, contact us by email or call one of our Brookfield, WI IT support specialists at (262) 522-8560.